The Mr has set up a windowsill garden for the girls since spring is here and they don’t have a garden to play & grow in plants in. Eva & Izzy have a small glass greenhouse the Mr picked them up in Ikea last year. They planted a few plants when we first bought it. Unfortunately girls pulled them apart trying to feed a ‘pet’ fly that was dying on their windowsill. Yes my children are weird. 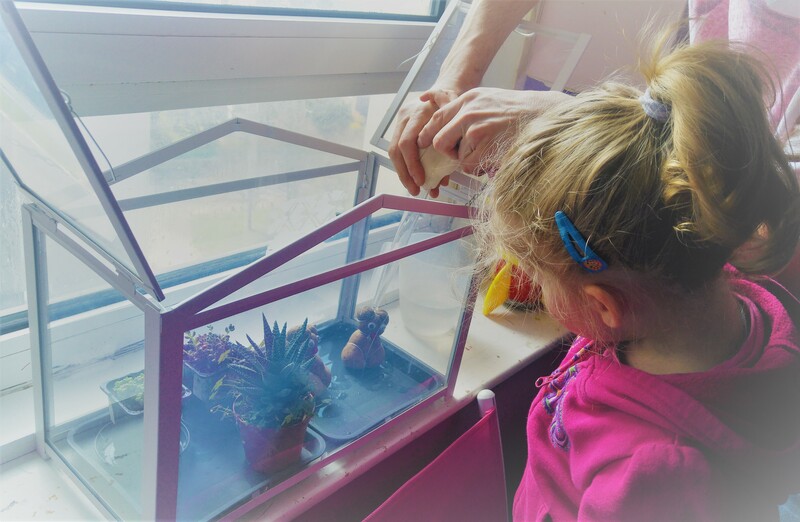 The Mr decided now both girls are older to try again so set the greenhouse back up on their windowsill & gave them a small succulent to get them started. Izzy then picked out these two weird little Bear grass head plants to grow with Eva. The girls really enjoyed getting involved and soaking their bears in water to help them start growing. They love doing things like this although they do pick some rather random plants! Izzy again went shopping with the Mr & came back with another two small succulents and a Grow kit for peppers! The Mr showed Izzy how to repot the small succulents into slightly bigger pots. She helped fill the bigger pots with soil before gently holding the plants as the Mr helped get them out of their tiny pots. Izzy was really excited to put the plants in the bigger pots and popped them in the greenhouse alongside the other plants. Next they planted California Wonder Pepper seeds in the pot of soil. Izzy enjoyed getting involved and getting her hands messy! Izzy placed the Peppers next to the greenhouse as it was too big to go in with the others. Luckily they had thought ahead though and bought a mini propagator for it! So far the girls have behaved with them & Izzy has remembered the bear heads need watering every morning too which is lovely! The girls have agreed Izzy will water the plants when Eva is at school & Eva will water them at the weekend. The Easter holidays are coming up so we’ve agreed they can take a turn each day then. I miss having a garden so much and growing our own fruit & veg, Eva loved growing & eating strawberries! its nice the girls are still learning to look after & grow plants even if it is only tiny random ones they have picked on their windowsill. That looks brilliant. Little Miss OMG hasn't he patience for gardening at the moment. Expects plants to shoot up straight away.. Alan Herbert recently posted...Fussy Eaters!